About Dr. Southwick - Frances Southwick, D.O. ﻿Frances Southwick, D.O. is a physician and non-fiction writer. Dr. Southwick earned her B.A. in philosophy from Colorado State University, her D.O. 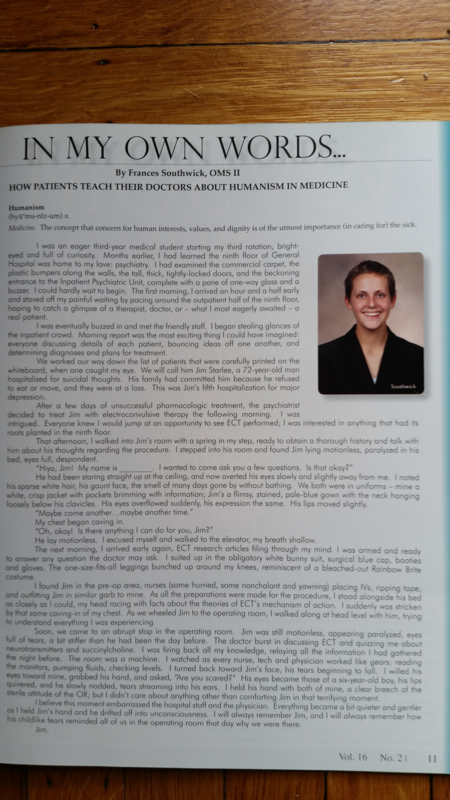 from the West Virginia School of Osteopathic Medicine, and completed her family medicine residency training at UPMC Shadyside in Pittsburgh. Her first full-length book, Prognosis: Poor, is a memoir addressing the medical training process in the U.S.
Dr. Southwick practices family medicine with special interest in Osteopathic Manipulative Medicine, trauma, addiction and queer health in Northern California. She lives with her wife Judith Avers and their beloved three gray cats. By sharing her life experiences, she aims to give validation, hope and peace to those in similar circumstances. Prognosis: Poor has been adapted into a 90 minute theater performance by Building Company Theater. If you are interested in Prognosis: Poor coming to your university, medical school or residency program, contact Building Company here for more information. Dr. Southwick has limited availability as a guest lecturer for pre-medical clubs, medical schools and residency programs. Contact her directly by email for booking information.